Be Palettø! is an experiment in architecture for public spaces created by a group of eleven students at the Aarhus School of Architecture in Denmark. The students used a limited palette of materials — well, only shipping pallets actually — and stacked them into a curvy strip to create a temporary pavilion. The newly-created space offers a fresh environment for students to mingle. 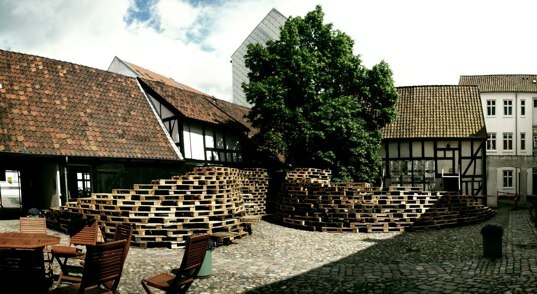 Be Palettø consists of 420 repurposed pallets stacked to form a serpentine wall around a courtyard. 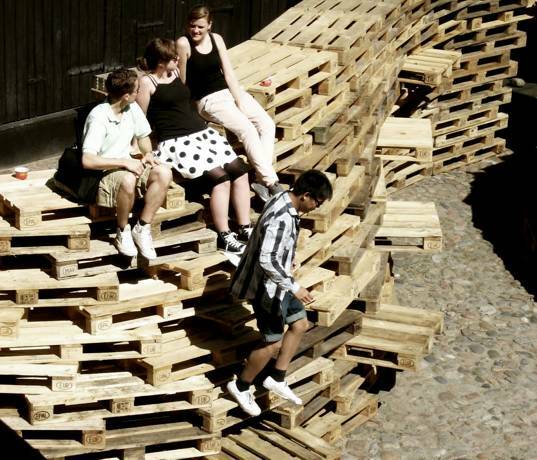 Pallets strategically jut out from the center of the wall to create steps along the parameter and act as a nice place to sit. The exercise succeeds in creating a sculptural structure, outdoor furniture, shade from the summer sun and a unique space for conversation or relaxing. Although the wall was only up for a week, it brought new life into the very traditional Danish timberfame buildings and courtyard — the curvature contrasts smartly with the timber’s grid. Check out this fun video of the making of the installation. Be Palettø! is an experiment in architecture for public spaces created by a group of eleven students at the Aarhus School of Architecture in Denmark. The students used a limited palette of materials — well, only shipping pallets actually -- and stacked them into a curvy strip to create a temporary pavilion. The newly-created space offers a fresh environment for students to mingle.